World's only industrial, street sweeper and leaf sucker capable of combining maneuverability, economy, serviceability with a superior sweeping performance. Fast sweeper delivering 100% dust control, maximum productivity and low operating costs, the industrial and street sweeper Dulevo 5000 Veloce is sure to fit your needs. The street sweeper and leaf sucker Dulevo 5000 Veloce is so versatile that it can be used to sweep streets, freeways, highways, fruit and vegetable markets or grain terminals easily and efficiently. Thanks to its speed it can be easily moved to different places avoiding any loss of time. Never before a machine has been designed from ground to address the concerns of the most demanding users. 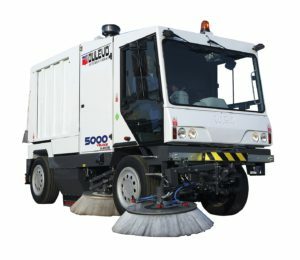 The street sweeper and leaf sucker Dulevo 5000 Veloce is easy to operate and maintain assuring many years of quality sweeping. Compact, quiet, comfortable, attractive and easy to drive the street sweeper Dulevo 5000 Veloce sets new standards of driver comfort with the latest technology in sound suppression inside and outside the cabin. The Dulevo street sweeper 5000 Veloce can reach speeds of up to 70 kilometres per hour. It is generally used by city councils and sites requiring large distances to be covered where travel speed is important. A winner on the road - The Dulevo 5000 Veloce, has our combined mechanical-vacuum system providing numerous clear advantages from its dual sweeping ability. This enhanced performance makes it ideal for the majority of urban applications, any time of the year. Use it in summer for sweeping fine road dust, sand and litter. During the autumn it bulks leaf and tree fall without manual assistance. It even operates during the coldest winter conditions. Just imagine, your 5000 Veloce could sweep an open market - any time of the year. The new combination of hydrostatic transmission and the latest EURO 4 engine (154 KW 209 HP), make it possible for the 5000 Veloce to reach speeds of up to 70 Km/h, ideal for applications which require long-distance transfers such as motorway repairs, cleaning contractors, local council authorities and civil engineering.